Gun dealer Kendra Lyman-Hood and her father, left, work their booth at last weekend's gun show at the Augusta Armory. Lawmakers are drafting bills in response to students' ongoing protests. And polls show most Americans want stricter gun laws. But, in a rural state like Maine, where hunting is a way of life and gun ownership remains popular, finding agreement about what those restrictions should be is difficult. 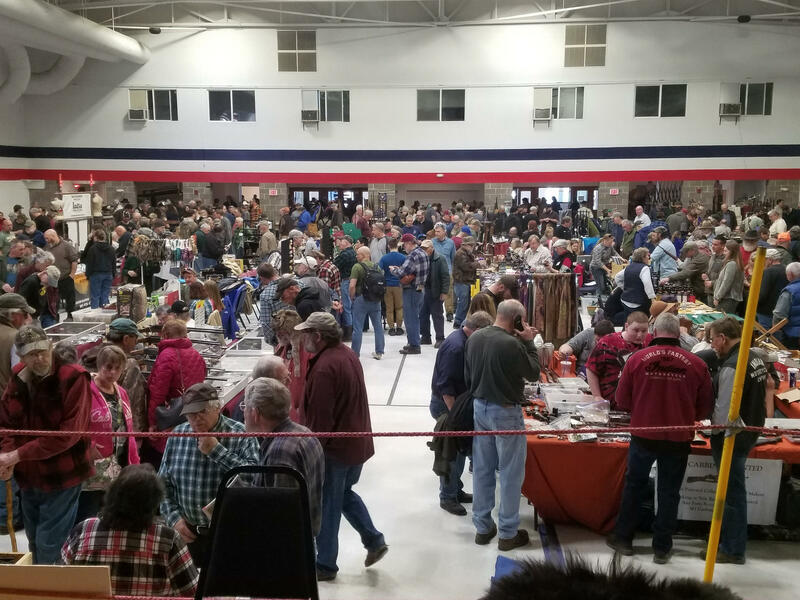 How difficult was evident at a weekend gun show. 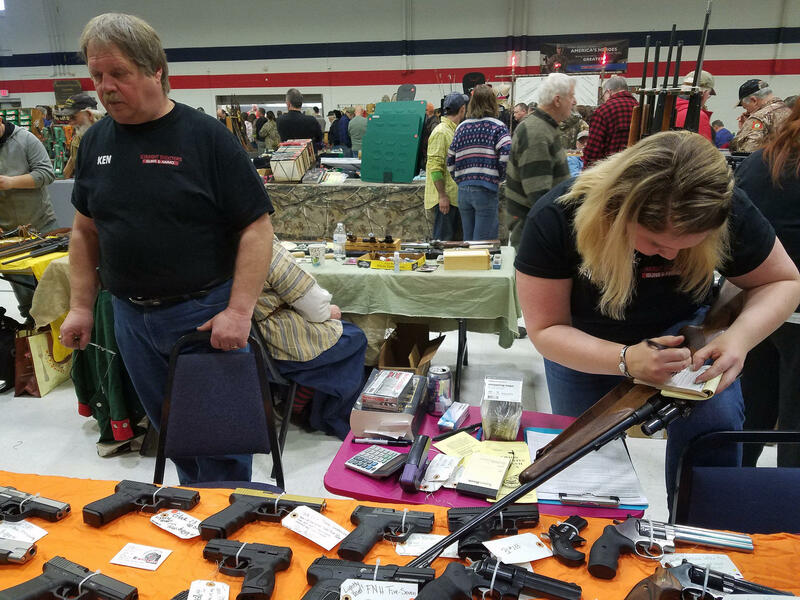 The two-day sport and gun show at the Augusta Armory last weekend featured weapons from the 17th century to the 21st, and it drew hundreds of people from across the state. Kendra Lyman-Hood is a gun dealer from Livermore Falls, where she runs a small gun shop with her dad. In between filling out receipts and running background checks at the gun show, she said after President Trump took office gun sales slowed down. But, over the past two weeks, they've been brisk. "You know, unfortunately, with this school shooting that we just had and the way Congress is talking about banning this, banning that, restricting this, restricting that, everybody's got into a little bit of a panic again. So, sales have jumped up." 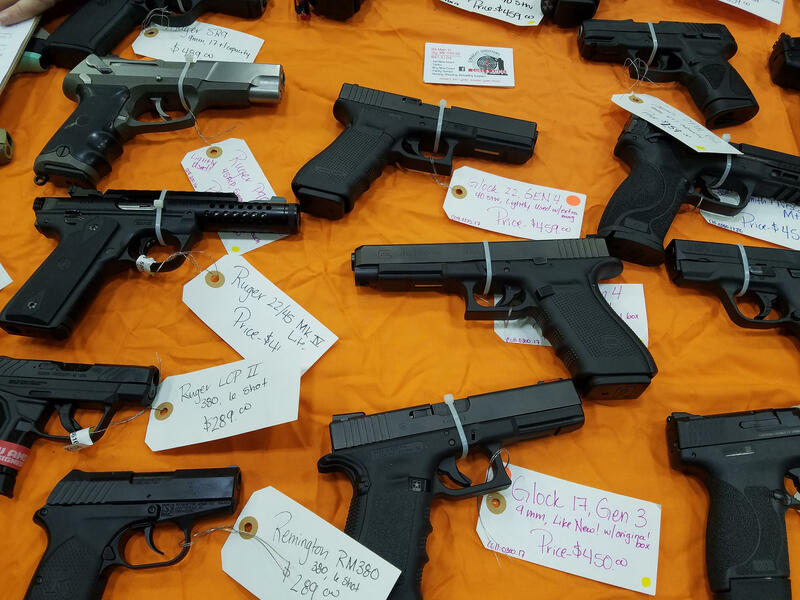 A variety of semi-automatic pistols for sale at the Augusta Armory gun show last weekend. And when it comes to talk of banning some semi-automatic rifles, like the AR-15 which has been used in several recent mass shootings, Lyman-Hood is not a supporter. "I don't think banning is the answer," she says. "Drugs are illegal but people still die from overdoses everyday and it's not the guns that are the problem. It's the people behind the guns that are the problem." That's a common refrain from gun enthusiasts. Lyman-Hood and her mother, Sheila, for example, come from a family of hunters where firearms safety was always a priority. But both also love nothing more than target shooting. And Sheila is a fourth-grade teacher. "We load up the jeeps and we have all of our different guns and pistols and we go to a sand pit. We've always had a lot of fun and I'm always hesitant to say that because people that have different attitudes about guns take that very offensively and I don't get it." 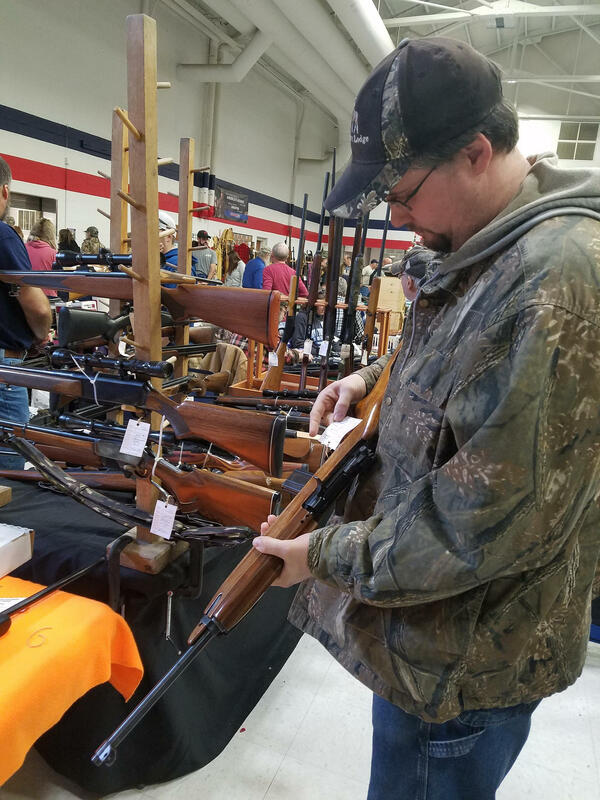 Derek Savage examines a gun at the Augusta Armory gun show last weekend. President Trump has called for arming teachers as one way to prevent mass shootings at school. Many educators have rejected that idea outright. Sheila says she's not sure what the answer is. But for her, violent video games need to be part of the discussion. She says young students are spending hours on end playing them and becoming desensitized to the damage they can do. That's also a priority for Derek Savage of Peru who says he wants to see better mental health screenings for gun owners. "You know, I'm not a person who says we should be walking in everybody's houses and testing what everybody's got and things like that. I think that's a breach of privacy," Savage says. "But I do think when it comes to guns themselves you should have some sort of check. There should be some checks and balances." "I'm a police officer and I'm also an advocate for the 2nd Amendment," says Tony Delvecchio, of Warren. Delvecchio objects to calls to ban the AR-15 and bump stocks, devices that attach to semi-automatic weapons and allow them to shoot faster. Delvecchio says someone determined to kill a large number of people will figure out ways to work around both. But he says he would support a two-week waiting period for the purchase of a firearm as long as it included a psychological evaluation as part of a standard background check. 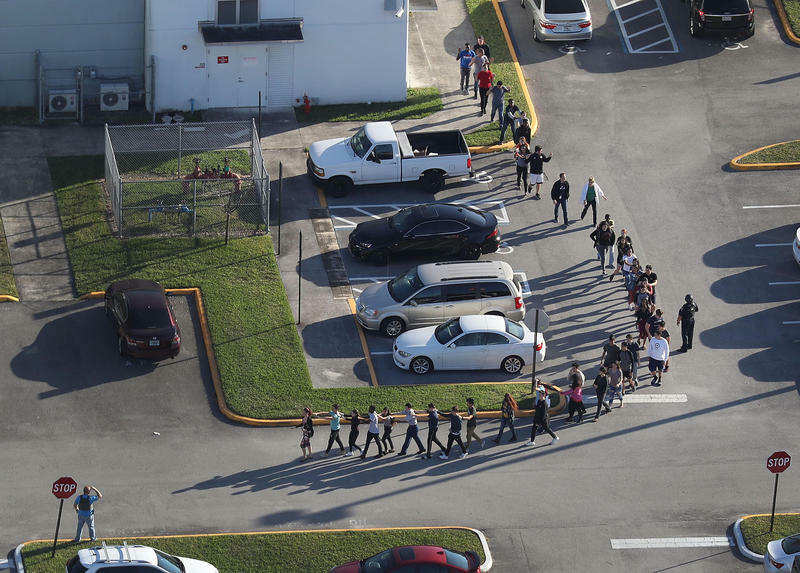 "As long as you go through the right steps to make sure that someone can mentally and physically take care of themselves and the firearm and be safe around people, than do what you gotta do to make sure it's done correctly," Delvecchio says. In response to the Parkland shootings, President Trump appears to be parting ways with the National Rifle Association over his suggestion that the minimum age to purchase a firearm should be 21 years old. And John Reid, who owns JT Reid's gun shop in Auburn agrees with the president. "You know you could come in here now, today, as an 18-year-old and you can't buy that Target 22 but only 18 years old you can turn around and buy these assault rifles. It doesn't make sense," Reid says. "It didn't make sense before this happened. It doesn't make sense now." 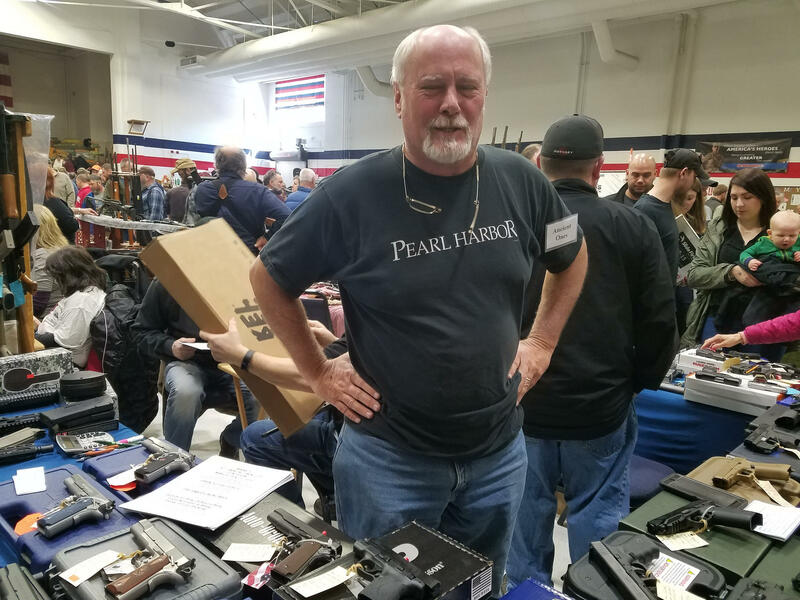 John Reid, of JT Reid's Gun Shop at the Augusta Armory gun show last weekend. But while the NRA objects to raising the age to 21, Republican Gov. Rick Scott of Florida has endorsed the idea. Scott also supports banning bump stocks, something Nick Wilson, executive director of the Maine Gun Safety Coalition says his group would like to see Maine lawmakers adopt. "We think the bump stock ban is the very least our lawmakers can do," Wilson says. "We saw how much damage it did in Vegas, and while it's not used a lot in these shootings, it makes no sense for us to have these devices on the streets." The coalition also supports limiting high-capacity magazines as a way to reduce mass shootings in schools. Gun collector Bill Damien of Greenbush says the AR-15, which the NRA has called "America's most popular rifle" has no place in society, but he says both approaches to gun control just won't work. Crowds pack last weekend's gun show at the Augusta Armory. "There's just too many of them out there," Damien says. 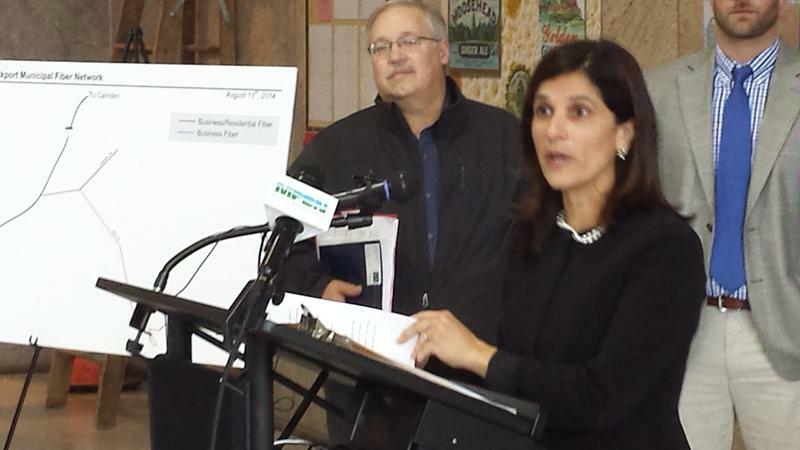 "A ban on extended magazines is not going to correct the situation. You know? I know for a fact that if they came to my house to pick my guns up it would take a truck." Instead, Damien says, the only way to make schools safer is to hire and pay professional security officers. Maine lawmakers will consider several after-deadline bills to address gun control and school safety on Tuesday. This story was originally published Feb. 27, 2018 at 6:26 a.m. ET.